This chart embodies some stereotypical thinking regarding the high growth opportunities now available in low income and lower middle income countries. Its from the just released World Development Report 2019’s concept note on the theme “The Changing Nature of Work”. Where the cognitive dissonance lies is in the accompanying text which highlights the transformational capacity of digitization and its impact on the nature of work in developing countries. 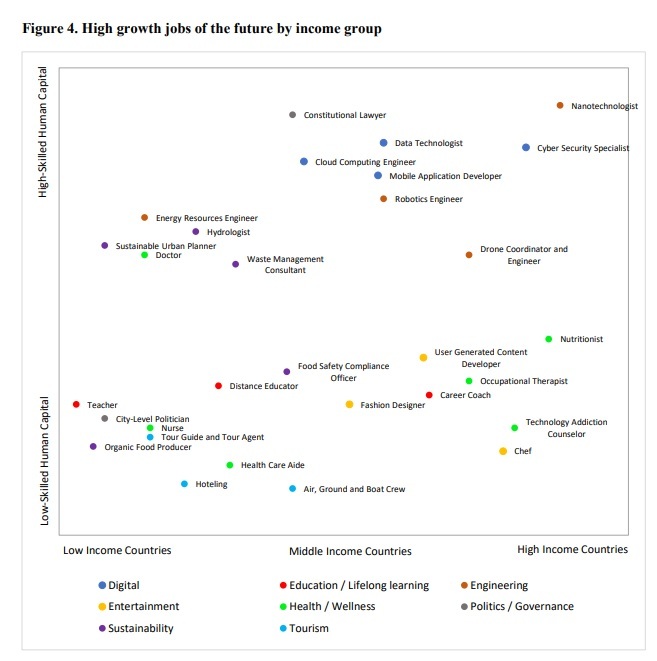 As this snippet shows, Kenya has been showcased as an example of such technology enabled change: Based on this, the chart’s positioning of jobs such as “mobile application developer”, “data technologist”, and even “cyber security consultant” should actually be further to the left, given that its the lower income nations where the majority of the future need will emerge from. Even fashion designers are not spared, placed as they are in middle income countries. Lagos Fashion & Design Week has become the byword for up and coming fashion brands, sponsored heavily by the likes of Heineken. Kigali is another hotspot for fashion’s rapid growth, and the local brand “House of Tayo” reached the pinnacle of global visibility with their bespoke suit for Lupita Nyongo’s brother, worn for the Black Panther premiere. The irony is that if this chart is used as is, without correlation to the transformations mentioned in the text, it will end up being the one thing that readers will notice when glancing through the final report. Diagrams and visuals catch our attention faster among reams of text. Further, if these are the predictions being made, how much of the unquestioned assumptions relegate lower income nations to tourism hubs and farming? Drones are being deployed for healthcare in East Africa, and being tested for parcel delivery where transportation is scarce. Won’t drone operators and robotics engineers find jobs if these initiatives scale as planned? Its the developing countries that face greater logistics challenges, lacking the infrastructure of the developed. There’s a strong case to be made for the redesign of this chart. It places an unfair burden on lower income and lower middle income countries, and implicitly relegates their future of work opportunities to the less skilled quadrant. Given the current and existing changes already underway, there’s a disruption waiting to happen if this is the chart that’s used for policy planning and analysis.